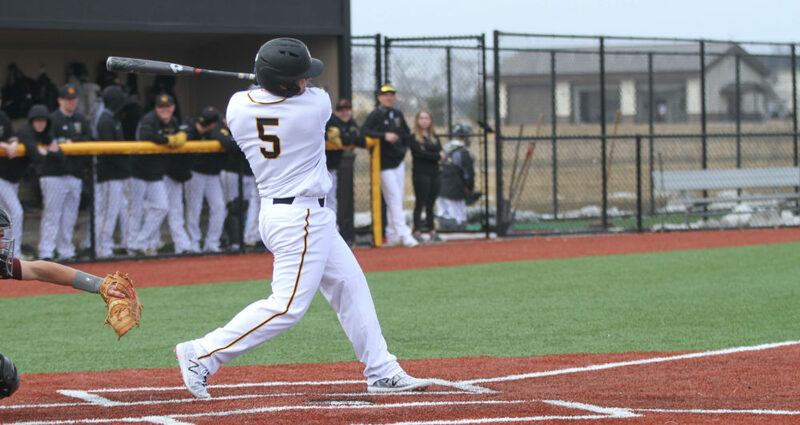 COLLEGEVILLE, Minn. – The Gustavus baseball team suffered a sweep at the hands of Saint Mary’s on Saturday. The Gusties nearly erased a late deficit in game one, but lost 3-2 followed by a decisive 15-6 loss in the nightcap. The Black and Gold move to 9-10 overall and 1-3 in the MIAC. Saint Mary’s scored a run in the first inning after a double and sacrifice fly, but the Gusties answered in the bottom half to tie the game. With two outs, Cole Pengilly (Fy., Le Sueur, Minn.) singled, stole second, and then stole third with the throw going into left field allowing him to come home. The Cardinals regained the lead at 2-1 in the second frame on another sac fly. Four scoreless innings passed before the Cardinals added an insurance run in the seventh for a 3-1 advantage. With two down in the bottom of the seventh, Ethan Mocchi (Fy., Champlin, Minn.) homered over the left-center field fence to come within one, but the Cardinals were able to get out of the jam to secure the win. Adam Stockwell (Jr., Apple Valley, Minn.) suffered the loss after four innings. He allowed two earned runs on three hits with three walks. The six Gustie hits were distributed among six players. After the Cardinals scored one in the first inning for another early lead, the Gusties responded in the bottom half with a pair of runs for their first and only lead of the day. Pengilly and Brice Panning (So., Hamburg, Minn.) each had an RBI in the frame. Saint Mary’s reclaimed the lead in the second with three runs on three hits before once again the Gusties answered with two runs in the bottom half to tie the game. Carter Clemensen (Fy., Cologne, Minn.) doubled home both runs. Saint Mary’s took the lead for good in the third inning with a couple runs and then the wheels feel off the Gustie train in the fifth as they surrendered seven runs on five hits and an error. Of Gustavus’s 15 hits, Clemensen (3-4, 2 R, 2 RBI) and Mocchi (3-4, R) led the way with three hits apiece. Six different Gusties saw time on the mound, allowing 11 earned runs on 19 hits. Gustavus returns to Saint John’s tomorrow morning for a doubleheader against Carleton beginning at 9 a.m.